The only remnant of Joelle's former life is her name. The only hint of her future is a foreboding vision of darkness. And her only hope is a man she has yet to meet. One of the last of a disappearing race, Joelle spends her days as a prisoner of the Long Hall, sweeping corridors and dusting scrolls while young wizards learn to ply their trade. In the dark of night, she practices the magical arts that are forbidden to one of her kind, hoping to soon break the spell that holds her captive. But an evil is growing beyond the enchanted stone walls. Joelle will need much more than her own skills to escape it. Someone is coming for her. And when he arrives, he will change everything. This short ebook excerpted from Emissary gives you a magical glimpse into the Realm--and the heroes who will stop at nothing to save it. 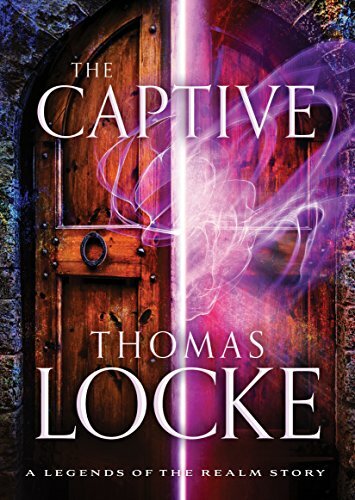 The Captive is my first book read by Thomas Locke. Knowing that Thomas Locke is a pseudonym for Davis Bunn I felt comfortable reading this e-short. I love fantasy but I do not love the modern trend in fantasy; it is beyond my ability to feel comfortable with as a believer in my Lord and Savior Jesus Christ. As Davis Bunn is a believer, I was hopeful that I would find a book in my favorite genre that didn't follow the negative trends. All of my wishes were fulfilled and I'm very glad that I read it. My reviews come from a Christian worldview but if you are not a believer don't hesitate to pick this book up. It is pure epic fantasy of the very best kind. The Captive is in no way touted as a Christian book, which I imagine is why it is written under a pseudonym. I have no reservations allowing my children to read The Captive and highly recommend it to each and every epic fantasy lover of any age. You can post it on your social media news feeds without regret.